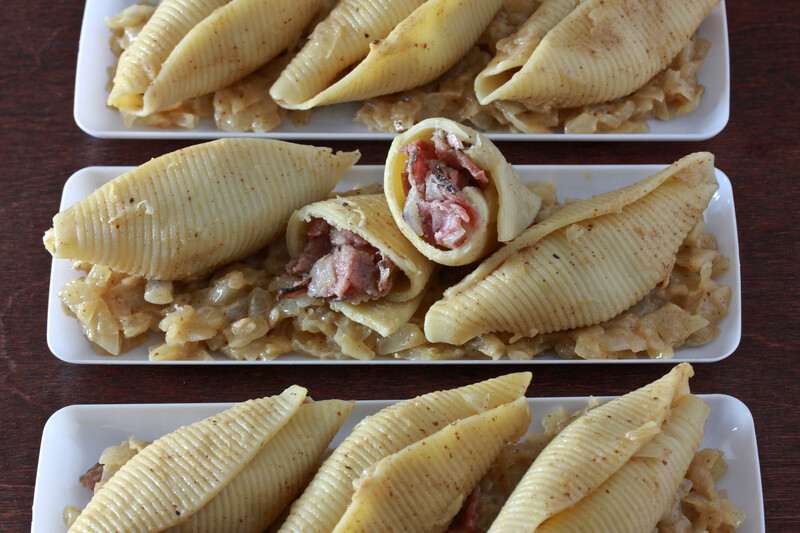 Pastrami Stuffed Shells with Honey Mustard Onion Sauce are unique, full of flavor, and a guaranteed hit! I feel like this dish should have been created ages before it was. Stuffed shells are a total staple of my cooking repertoire. I’ve done dairy stuffed shells, made with a cheesy filling. I’ve done meat stuffed shells with a ground meat filling. I’ve added vegetables to give it a healthy twist, and played around with spices. And suddenly when my sister and I were planning our recent holiday meals, another type of stuffed shells hit me. 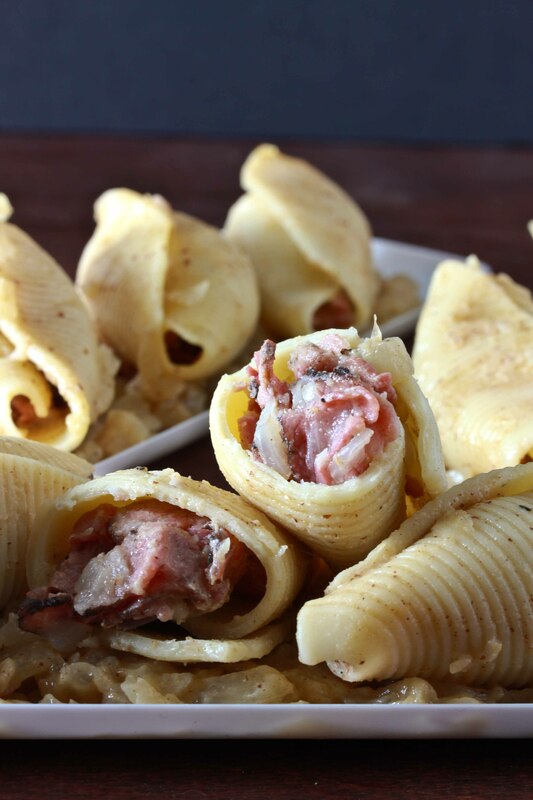 Why not stuff the shells with a delicious pastrami filling? And instead of the classic tomato sauce to bake it in, I knew I’d pare this with pastrami’s friend honey mustard. And it worked so well! Not only did it serve up beautifully, but everyone licked their plates clean. So whether you’re serving this as an appetizer or a side dish, this fun and innovative take will be sure to please! Note: there are duplicates of the ingredients below, but they are for separate parts of the dish, so follow the directions carefully -and go in order. Note: this recipe is not intended to overstuff the shells. If you want them very full, either halve the shells or double the filling. Boil pasta according to package directions and set aside. In a medium pot, sautee the onions in oil over a medium-low flame until translucent. Meanwhile, heat the oil in a large frying pan over a medium-high flame. Add the pastrami and stir occasionally, for about 5-8 minutes, until the pastrami is cooked through but not crispy yet. Add the mustard, garlic powder and ⅓ of the sauteed onions. Sautee for an additional 5 minutes, then set aside to cool. In the pot with ⅔ of the sauteed onions, add the mustard, honey, salt, pepper and white wine. Heat until simmering and cook for a couple of minutes. Set sauce aside to cool. 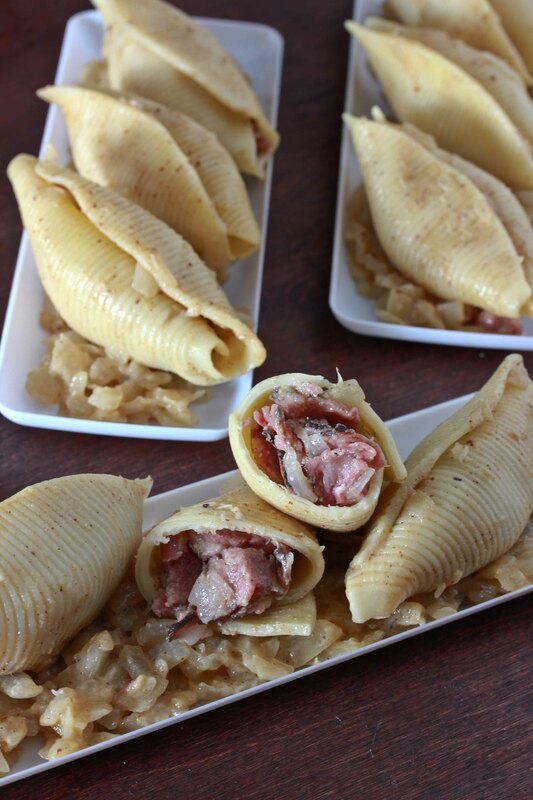 Stuff the pastrami mixture inside the cooked shell pasta and place in the bottom of a large roasting pan. Pour the sauce over the shells. Cover the pan tightly and bake at 350 for 30 minutes. This dish freezes nicely. For best results, add additional sauce when reheating. Hope you all had a fabulous weekend! Come back soon for more delicious treats! -Miriam PS: do you follow me on Instagram yet? Because if not, you totally should. Unless you don’t like to see pictures of yummy food. Then don’t follow me at all! While this doesn’t appeal to me for obvious reasons, I love the idea! I’ve actually never seen fleish stuffed shells before. That sounds delicious – proper comfort eating. My husband loves pastrami and this sounds intriguing…may have to make for him! What a great idea! I never would’ve thought of this kind of a stuffing for pasta! I’ve never heard of a such thing, but my parents will go crazy over this! (and Murray in spirit). I just really wanted to compliment you on the gorgeous photography through out all of your posts! I believe that the key to a successful blog is through great pictures, something that many blog start up are missing. I think that all your photographs are truly stunning! Awesome job! This sounds awesome! Can’t wait to try it! Do you think it would be just as good with corned beef? We’re not that fond of pastrami. Made these and they r DELICIOUS! thx 4 the amazing blog! can i freeze this raw and bake before serving? The sauce didn’t really have any liquid – is that how it’s supposed to be? Also, I see you mentioned that after freezing, it should be rewarmed with extra sauce. Does that mean I should freeze some more sauce separately and use to rewarm? It’s not very liquidy. You can freeze some extra sauce, or make more just before serving. I spend my days thinking about food and I am also looking at recipes for ideas. It’s not often where I see multiple recipes that seize my attention. I don’t know what you are doing to creat these masterpieces, but keep it up! Can I replace the white wine with something else or omit it? Broth (vegetable or chicken) would be your best bet. Is there enough filling for the entire box of shells, or should I only try to do half? It depends how full you stuff them. I didn’t stuff them all the way, and had plenty of filling. If you want overstuffed shells, you should half the pasta. I don’t think I overly stuffed them, but I only had enough stuffing for 17. How much of the stuffing did you put in each one? Also, any idea what to do with my leftover shells? I made them in a fleishig pot so can’t make traditional cheese stuffing. These look fantastic and plan on making them for Rosh Hashana. I realize that you have duplicate ingredients for the two parts, but can you share which amounts are for which? Thanks! Should I use sweet white wine or dry? I made this recipe into an ‘unstuffed’ version with medium sized shells. It came out delicious!!! Thanks for all of your great recipes!! How did you make them unstuffed? I can only get small shells gf not the large stuffing kind but I so want to make this. I am in the middle of making it. It looks amazing! what type of white wine? dry or sweet or doesn’t mater? I’ve made these before and they’re delicious! But each time I can’t quite figure out how to keep the shell closed! I use less stuffing and the shells still pop open. Not all, but quite a lot. Any hints to keep them shut? Why type of white wine did you use? Dry white wine, but whatever you have will work. Can I skip the wine altogether? Or what can I replace it with? These taste good, but they only made 18, and I put a scant teaspoon in each and increased the stuffing mixture! You should be more accurate with your ingredients . These are pretty tasty and I applaud the creative idea but with the numerous dirty dishes and patchke steps, I would not make it again. Also anyone attempting this recipe, take note of Barbara and Chava’s comments above. The recipe as is fills half a box of shells scantly. What sauce can I do instead of honey mustard or a tomato based? Or what can I use instead of mustard? I made these last year, and they were delicious. Huge hit. BUT…they required a lot of steps and even though I doubled the filling and sauce recipe for one package of shells, I didn’t think it was enough. I would probably make this again, given the taste but I would triple both the sauce and filling recipe. Hi Miriam…could you detail exactly what measurements go with the pastrami vs what measurements go with the onions…this confused me and not sure how this recipe will come out…I’m crossing my fingers. Thanks!! You’re welcome to try it. I can’t say for sure as I haven’t tried it. Can i use red wine instead of white wine? I bought pastrami cubed squares, the ones that are cooked already as in coldcuts. Should i still sautee them in onion? Maybe for 2-3 minutes? How come the version of this recipe in your new cookbook is different, most significant here you say one 6 oz pkg of pastrami while in the cookbook it says 12 oz. but you keep the amt of onions the same, 3 large ones. and then the seasoning is different? Can I freeze it before I bake it, then thaw and bake?